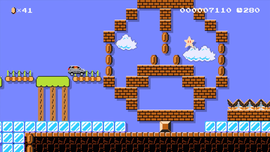 Mercedes-Benz Jump'n'Drive is an Event Course in Super Mario Maker released on December 9, 2015. It unlocks the GLA Mystery Mushroom costume upon completion. The level begins with an autoscrolling segment, along with Ice Blocks arranged to spell "Mercedes". A warp pipe appears afterwards, which leads to a Skull Raft and a tune before the ? Block containing a Mystery Mushroom with the GLA costume is revealed. Another warp pipe appears, and when entered, it takes Mario to another autoscrolling segment. Mario must then enter a door, grab a Super Star to travel across some spikes to enter another door, then collect another Super Star to take out all of the Piranha Plants and Big Piranha Plants in the area. Mario must then enter another warp pipe signified by an arrow sign, then follow a labyrinth of Wigglers and Goombas, until he reaches a Super Star and takes out a Thwomp, leading over to the next room, one with Lakitus throwing coins. Another warp pipe appears, followed by some more Wigglers, as well as some winged Deep Cheeps. A brief vertical climb follows, along with the Checkpoint Flag and a warp pipe leading to the next segment: an area with conveyors, Goombas, and Bob-ombs. This leads to one final warp pipe, which in turn leads to the Goal Pole. This course was created by a team of Mario fans at Mercedes-Benz. They were inspired by the GLA's appearance in Mario Kart 8 and wanted to build a level in which Mario takes the GLA on a road trip from the city into the mountains. Of course there are a few secrets–can you find the hidden garage and gain access to the underground club? This page was last edited on October 10, 2018, at 10:17.